There is no question in my mind that the 260-mile Texas Water Safari indeed lives up to its billing as the world’s toughest canoe race. After my son Jonathan and I reached the finish line this past June, the feeling of relief was almost as intense as my physical exhaustion. Still running on the adrenaline of our final push to the finish line, I managed to stay awake for a few more hours to enjoy the food and fellowship at the awards ceremony. And then, I slept — a lot. I fell into that deep slumber I associate with the first couple of days of jet lag after returning home from one of my long international trips. It felt surreal to actually take a hot shower and crawl into my own bed after paddling a canoe for almost four days with little rest. The top question that family and friends asked me after the race was, “Will you do the Texas Water Safari again next year?” In the days immediately following the race I did not want to think about the possibility of spending four days in a canoe again. I was thrilled that Jonathan and I had spent 90-plus hours together and had reached the finish line. So, my standard answer was, “Possibly, but I am just happy to have reached the finish line with my son.” In the weeks following the Safari, Jonathan and I competed in two more races, the longest of which was 100-miles. When Jonathan told me that he really wanted to improve his time in next year’s Texas Water Safari, we agreed that he needed a younger and faster partner and I told him that I would be honored to serve on his support team. He thanked me but did not let me off the hook and suggested that I seriously consider doing the race with my friend and fellow staff member, Doyle Lowry. Doyle at the Martindale Dam portage. Long story short, Doyle and I will compete together in next year’s Texas Water Safari. I agreed to do this because it has now been a few months since competing in this year’s Safari. Time has mitigated my memories of the physical exhaustion, sleep deprivation, hunger, heat, headwinds, night-time hallucinations, wearing the same clothes for four days, and not being able to feel my hands by the end of the race. 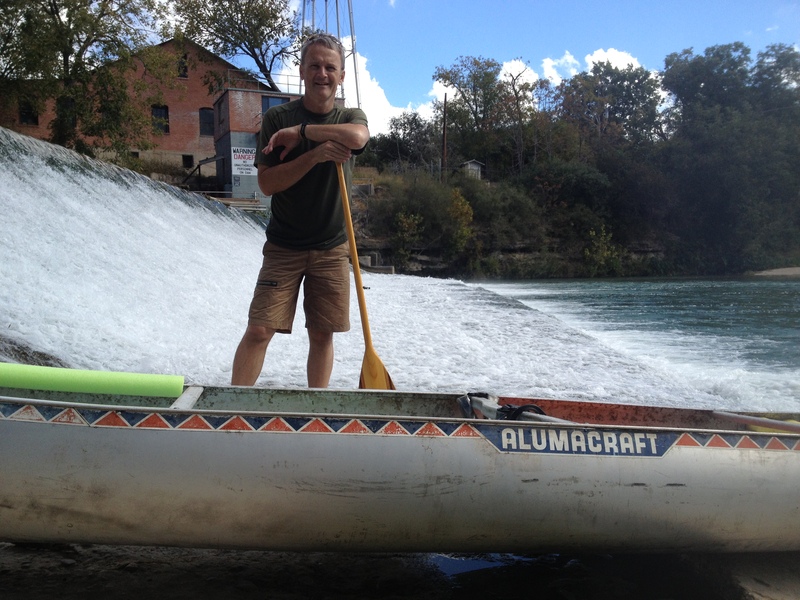 On Friday, Doyle and I did our first training run together on the San Marcos River. We borrowed a canoe from the Whittington’s because the canoe we purchased is still being safari-rigged for the big race. Our canoe will be ready in a couple of weeks, just in time for our next training run. Friday was the first time that Doyle and I have paddled a canoe together. We had an adventurous time on the river, thanks in large part to the low water and lots of exposed rocks and debris. We had a couple of spills and more than a few laughs. Doyle got a really great bruise on his leg from a spill at Cottonseed Rapids. I suggested that he wear shorts to work for the next week so that folks can admire his new badge of courage. The bottom line is that we know we are going to have to spend a lot of time on the water in order to learn to paddle efficiently and navigate effectively. We are all in! We hope to do at least fifteen training runs and two lessons before next June. Barring something unforeseen, our goal is to reach the finish line of the Texas Water Safari. That in itself will be the equivalent of a gold medal for these two 50+ year-old pastors! May God bless your time and work together. And I just know God will carry your experience over to the larger team of Kingsland staff as you all navigate the waters of this interim period without a head pastor. Looking forward to hearing more of this adventure! Thanks, Pam. Doyle and I know that we have a lot of work to do to get ready for the race but we are willing to pay the price. Looking forward to some exciting (and exhausting) days ahead on the river. Will continue to post updates as we continue our preparation. Thanks. We know we have lots to do to get ready and are excited about the opportunity to share this adventure.